What music would you listen to if you had to bike alone through snowdrifts, headwinds strong enough to knock you over, darkness and insanely cold temperatures for more than 2,000 miles across Alaska’s rugged landscape? What would motivate you to keep going, even with a frostbitten toe and two others missing due to frostbite from a previous race the year before? For Billy Koitzsch, a 42-year-old avid winter cyclist and owner of a fat bike rental and guiding business in Anchorage, the music had to be something fast, like techno or trance. But that only worked when the wind wasn’t blowing the headphones off his ears. His motivation: a true love of the sport and a childhood dream. 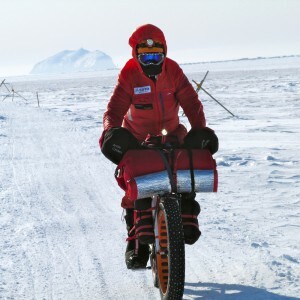 Koitzsch’s epic journey officially began on Feb. 22, 2013, when he departed from Knik in Southcentral Alaska, pedaling and pushing a fully loaded, 115-pound fat bike on what would be a record-breaking bike ride. Unofficially, the journey started nine years prior when he began preparing physically and mentally for the long, lonely ride. For 40 days and 40 nights, Koitzsch followed the 1,000-mile southern route of the historic Iditarod Trail Sled Dog Race to Nome, and then continued to bike along the second half of the Iron Dog snow machine race trail — an additional 1,000 miles to Fairbanks in Interior Alaska. He lost 40 pounds during the trek and his body took months to recover. No stranger to traversing Alaska’s backcountry on a bike, Koitzsch’s romance with winter endurance riding began in his teens when he visited his father in Nome and witnessed the first cyclists to bike the famous gold seekers’ trail cross the Nome finish line. A couple of years later he scored his first high school job at a local bike shop in Fairbanks, working for the person who invented the fat tire bike. He has since participated in numerous races that utilize the Iditarod route — some with trails less groomed than others — ranking high among the finishers. The 2013 journey was Koitzsch’s second attempt biking the Iditarod and Iron Dog combined trails. His first attempt was in 2012 when he began racing the 1,100-mile Iditarod Invitational race. On a day when the temperatures shifted from 30 degrees to 30 degrees below zero, Koitzsch suffered frostbite on two of his toes when he stopped to help fellow cyclists carry their bikes across a frozen river and his foot broke through the ice. After seven years of training, it was disheartening, to say the least. Not one to give up on a lifelong dream and despite the disapproval of his doctors, Koitzsch set off one year (and two removed toes) later, once again to bike through the places he learned to love growing up between Fairbanks and Nome. 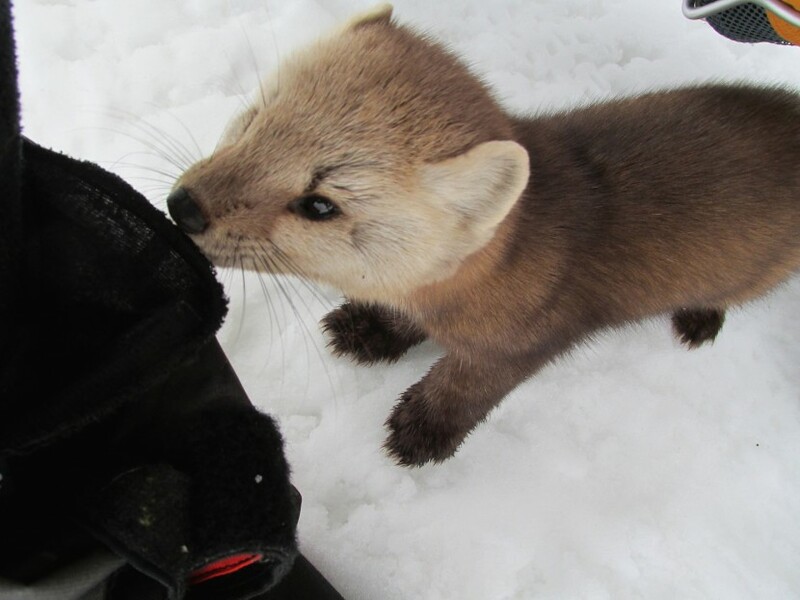 He shared the trail with fox, wolverines, moose, wolves, a rare, red-haired marten and other animals, but most human interactions were limited to the checkpoints along the way. Talking to himself, screaming out loud and swearing at the wind became a routine part of his day. There were moments when quitting seemed like the logical decision. Sometimes, Koitzsch powered through everything Mother Nature threw at him with the goal of making it to just one more checkpoint before calling it quits. But the day he stepped into a cabin 1,600 miles into his route and came across a diary entry about the late Iditarod dog musher Susan Butcher who died of cancer and whose ashes were scattered in that spot, was the day he knew nature wouldn’t win. He would finish what he set out to do. Just over a month later on April 5, Koitzsch pushed through the last stretch of his treacherous backcountry expedition to arrive at Pike’s Landing in Fairbanks. It was so fitting that, in the backdrop of his final stop, the words “Love Alaska” stood bright. 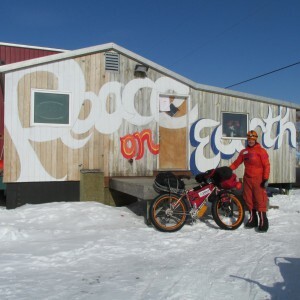 Koitzsch is the first person to have biked this stretch of land in Alaska. Now that he has gotten the 2,000-mile bike-riding bug out of his system, Koitzsch is focusing his attention on adventures with his family and, together with his wife Erica, has resurrected the original Iditasport Ultramarathon bike, ski and foot race that had dissolved in 2001. 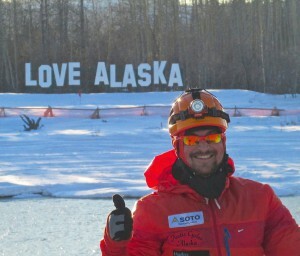 As Iditasport race director, Koitzsch works tirelessly to pass on to fellow cyclists his knowledge of how to safely take on Alaska’s treacherous weather and terrain. 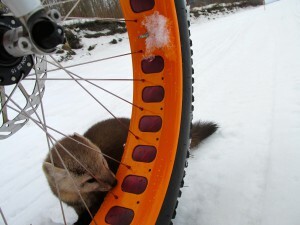 Winter bike riding has increased in popularity in Alaska over the last few years. There are numerous races of various lengths that draw ultra cyclists from all across the globe. Even in cities like Anchorage, it is very common for skiers to share the greenbelt trails with people pedaling the massive-tire bikes. While we wouldn’t necessarily recommend you try to emulate Koitzsch’s feat, we’re all for having yet another recreational sport to get Alaskans outside during the chilly winter months!